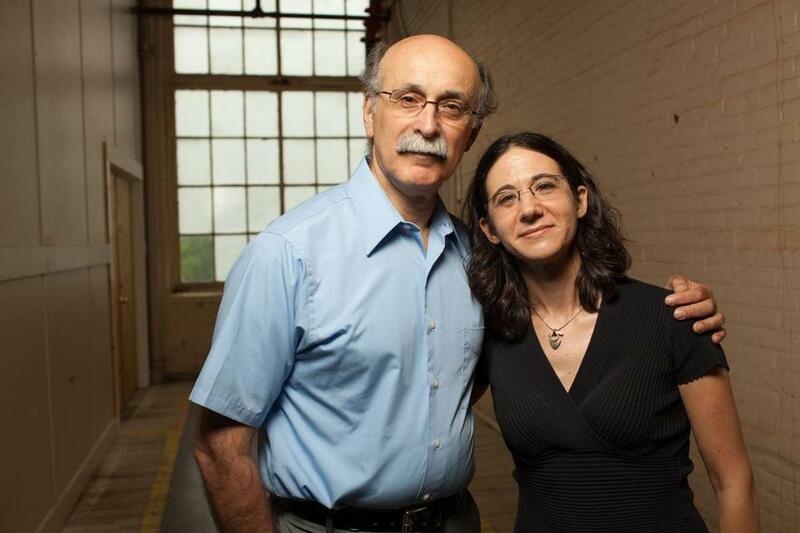 Robert and Jen Meeropol are the son and granddaughter of Ethel and Julius Rosenberg. “They killed my grandparents,” Meeropol replied. 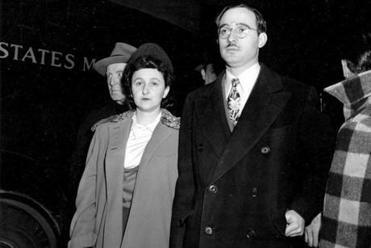 For as long as she can remember, Meeropol has grown up with the knowledge that her grandparents, Julius and Ethel Rosenberg, were convicted of conspiracy to commit espionage — passing atomic secrets to the Soviet Union. On June 19, 1953, the couple were put to death in the electric chair at Sing Sing Correctional Facility in New York. The executions drew international outrage during the era of McCarthyism and anticommunist sentiment. Meeropol, 40, is now assuming stewardship of the Rosenberg Fund for Children, the Easthampton nonprofit established by her father, Robert, in 1990. The fund provides grants for education, counseling, and other services for the children of activists and, in some cases, for youth activists. Transferring the fund’s daily operations to his daughter, Robert Meeropol said, will ensure it will stay relevant to a generation raised on social media and facing a different array of issues than those that confronted the children of his own generation, the ’60s. Jenn and her sister, Rachel, were teenagers growing up in nearby Springfield, where their father and his brother, Michael, were professors at what was then Western New England College (now University), when Robert started the nonprofit. Having their father launch the fund that would take over their lives “was like having a late-in-life sibling,” Jenn said. Many beneficiaries of the fund’s grants, she said, have been affected by their parents’ imprisonment or loss of employment resulting from their environmental activism, the economic protests of the Occupy movement, or opposition to the sort of “national security apparatus” that has arisen since 9/11. “Many of them are in no way dangerous or violent, but what I would consider active participants in a democracy,” she said. In June, the organization marked the 60th anniversary of the Rosenbergs’ execution with one of its periodic events, a staged performance at New York’s Town Hall , narrated by Angela Davis and featuring Eve Ensler as Ethel Rosenberg. The Rosenberg Fund for Children advisory board includes such well-known celebrity activists as Harry Belafonte, Ed Asner, Pete Seeger, and Susan Sarandon. The fund, Robert Meeropol said in a recent interview in its office on the third floor of an enormous old mill building, was created out of “the need to make something good out of my childhood. “I think of it as my constructive revenge,” he said, sitting alongside his daughter, with a vivid red poster of the Rosenbergs hanging over their shoulders. His older brother, who was 10 when their parents were put to death, (Robert was 6), has often named “The Count of Monte Cristo,” with its themes of wrongful imprisonment and vengeance, as his favorite book. “I think there’s something healthy about revenge,” said Robert, 66. “The desire is not to be a pincushion. As boys, the brothers were adopted by Abel and Anne Meeropol, after being cared for by their grandmothers and other relatives. The late Abel Meeropol was best known for writing the lyrics to “Strange Fruit,” a ballad about a lynching, which Time magazine named the Song of the Century in 1999. After growing up in fear that their exposure would result in violence against them, the brothers went public as the Rosenbergs’ sons in 1974 and co-authored a book published the following year. They worked for years to reopen their parents’ case, asserting their innocence; in recent years the brothers have come to the conclusion that their father was in fact involved in espionage (but to a lesser extent than prosecutors stated), and that their mother was an innocent woman wrongfully accused. For years, Robert said, he was inclined not to seek publicity for the fund, or even to acknowledge whom it was aiding. As children, he and his brother were instructed to keep the identity of their biological parents a secret. But Jenn Meeropol is grateful that her parents shielded her and her sister from any feeling of persecution, while making them aware of the family history. Having worked at her alma mater, Brown University, for a voter recruitment and participatory citizenship initiative established by the school’s former president, she expects to usher the organization into a new era of increased visibility by using Facebook, Twitter, and other social media that could attract younger activists. “There’s so much good will and a sense of family and community present at our gatherings,” she said. Since joining the small Rosenberg Fund for Children staff several years ago as the granting coordinator, she has developed close relationships with many of the families the fund assists. Robby, as he is still known to his loved ones, said that acquaintances often commend him for the “sacrifices” he has made on behalf of children in situations similar to his own when he was young.